Beauty dishes are an extremely popular lighting modifier. 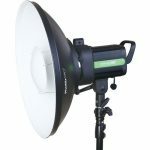 Phottix is pleased to offer a 51 cm Beauty Dish with honeycomb grid and cloth diffuser. 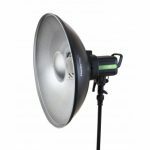 The Phottix Beauty Dish MK II comes with a Bowens-compatible mount, and is compatible with all Phottix Luna Speed Rings. The speed ring is easy to swap out and can be used on many different brands of studio lights. The interior of this dish is silver, for snappy highlights and better contrast.